PokÃ©mon Black & White is going to take players worldwide, but not just to trade. Details from a future issue of Japan's Coro Coro Comics have leaked, revealing a new online play mode for PokÃ©mon Black & White. 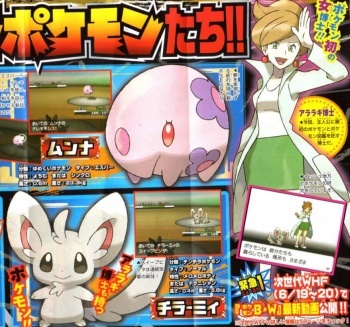 The details also reveal a totally new professor, in more ways than one, and information on seven new PokÃ©mon. PokÃ©mon Black & White will not only feature never before seen 3D graphics, but also a "Random Match" mode that connects players for online battling, accessed through the game's PokÃ©mon Center. When PokÃ©mon Black & White are eventually released outside of Japan in spring 2011, this mode will allow for worldwide online play. This might not be the PokÃ©mon MMOG fans have been clamoring for, but it's a step in the right direction. The new features don't stop there. PokÃ©mon Black & White will reportedly feature the series' very first female professor. Professor Araragi has lady parts and will give players their starting PokÃ©mon and PokÃ©dex. She's researching PokÃ©mon in the Isshu region, just in case you were wondering.